Summer was awesome and October has just arrived. Being fully recharged with summer vibes, autumn is slowly showing his colours, inviting us to go back inside and unleash our musical creativity. Isn’t this just excellent timing for one of the largest annual music events in the world? Amsterdam Dance Event – ADE2018! Please note that the deadline for submitting your tracks for the feedback sessions is Thursday the 12th of October. The Feedback Sessions on Thursday and Friday are ‘invite only’. Submit your track before the 12th of October and receive your invite. The Conference and Masterclasses on Saturday and Sunday are tickets only. You’ll find ticket links in the descriptions below. If you want to improve, you have to ask for feedback. Abbey Road Institute Amsterdam is partnering up with GRAP to offer another series of feedback sessions! During these sessions, music industry professionals help and guide new and upcoming artists by giving them constructive feedback on their music productions. The ADE feedback sessions on Thursday will have a specific focus on the Pop music genre. Our Thursday panel will include both songwriter-producer Nick Ribbens and engineer Robin Reumers. They will give their valuable input on the creative- and technical side of your music and the potential of the/your artist from an A&R-point of view. What you have to do? Submit your track before the 12th of October to get selected for your personal feedback session of 15 minutes. You may have noticed that we are in the middle of a glorious analog synthesis revival. Many of the most powerful and versatile analog synths ever made have been re-released in recent years. Modular synthesis, in particular, allows a sound designer to connect almost anything to everything. The result is a universe of sonic possibilities! But where to go from there? True sound doctor MarcoAntonio Spaventi is here to show you how you can integrate modular synths within Ableton Live. Using his impressive Eurorack modular from his personal collection as a reference, he will give you an exclusive look into his own production process. And his lectures are brilliant. The Italian-born MarcoAntonio is a professional sound engineer and producer and well known for his solid technical expertise. He has worked on many different projects, both as a solo and collaborative artists such as the RAG collective and the Crystal Maze duo. This particular masterclass is for music producers wanting to elaborate their productions and/or adding a professional touch to their music. It’s a free workshop without registration, but keep in mind that places are limited! Abbey Road Institute Amsterdam and GRAP are partnering up to give you more insight into how to build your business! Paul Hazendonk (Manual Music), Martijn Mischgofsky (Misc Agency), Benjamin Smit (Anna Agency) and Esther van der Poel (PACCT) are coming over to talk with you about building your own business/network and the promotion of your dance act. What are the options for the promotion of your release? Where do you start? Who’s important in the promotion of your own release? What’s the role of a manager, booker or label? Lots of questions to be answered! These professionals will answer all of them and on top of that they will share their experience and give you tips and tricks on this important side of the music industry. If you’re a musician/artist/producer ready to take it to the next level, chances are you’ve considered getting a manager, a publisher, a label, a booker and started looking for a professional engineer to mix or master your tracks. Each of them has the potential to open doors and boost your business. But whom to consider first and how to prioritize them? Music & entertainment lawyer and Abbey Road Institute lecturer Bindu De Knock will take you through the whole process and the individual stages. How do you find the right people for your team? And how can they help YOU to focus on the most important thing; your music? After all, there is a reason they call it THE music BUSINESS – it takes effort and hard work building a music career. Including razor-sharp focus. Bindu De Knock hails from Belgium but is currently working as a lawyer in Amsterdam. Bindu is the founder of CrossLink Legal, a law firm specialised in Music, Entertainment & Intellectual Property Law. Bindu is experienced in advising, negotiating and litigating in a broad range of music industry matters and represents Top DJ’s, songwriters, vocalists and other creatives. At Abbey Road Institute and other renowned institutions, she teaches about legal issues for musicians. An active musician and producer herself, she published Noot Voor Noot in 2015, a book that serves as one of the most comprehensive introductions to copyrights for musicians. Bindu co-hosts the Music Wise Podcast with American entertainer/coach Rhona Bennett (and member of R&B band En Vogue). Amsterdam Dance Event is nearly there, so get ready! 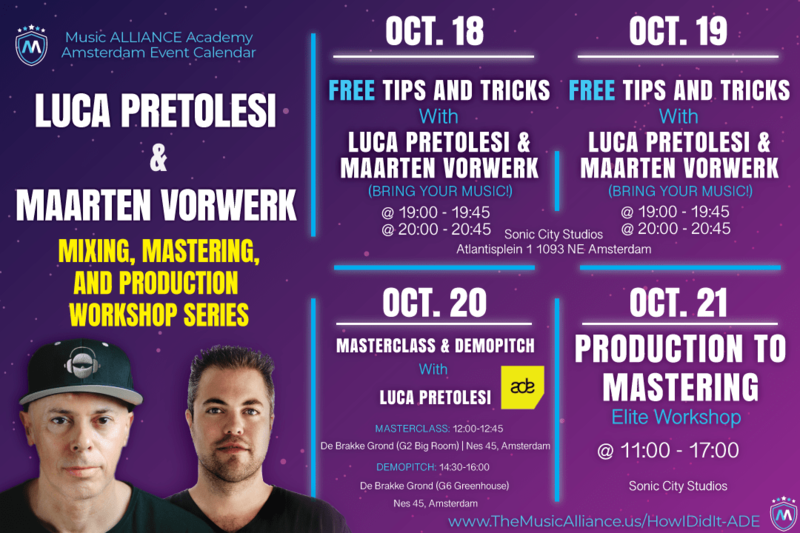 On October 18th and 19th, Luca Pretolesi & Maarten Vorwerk are coming to Sonic City Studios (at Q-Factory) to host free lecture sessions about production, mixing and mastering techniques. Gain valuable tips, learn new tricks, get inspired and get your questions answered by these two renowned industry professionals! If you want to improve, you have to ask for feedback. Abbey Road Institute Amsterdam is partnering up with Studio DMI to offer a series of feedback sessions! During these sessions, music industry professionals help and guide new and upcoming artists by giving them constructive feedback on their music productions. The ADE feedback sessions on Friday will have a specific focus on the Dance Music genre. The panel will include producer and engineer Luca Pretolesi and artist Maarten Vorwerk, who will give their input on the creative- and technical side of your music, as well as on the potential of the artist on an A&R-point of view. Amsterdam Dance Event is nearly there, so get ready! On October 18th and 19th, Luca Pretolesi & Maarten Vorwerk are coming to Sonic City Studios (at Q-Factory) to host free lecture sessions about production, mixing and mastering techniques. Gain valuable tips, learn new tricks, get inspired and get your questions answered by these two renowned industry professionals! Free entrance! Come to one of the two sessions mentioned above. On Saturday, October 20th, Revealed Recordings will be back with the yearly organized Revealed Day Conference during ADE. On this day, you will have a unique chance to step into the world of Revealed Recordings. Join the Hardwell Remix Contest session! Pre-registration is mandatory due to limited capacity. Remix Hardwell and get a chance for an official release. The best idea will be selected after 1,5 hours! More info on our Facebook Event Page. LMG Outfly Music Group is back on the Revealed Day Conference! Register now for the exclusive Live Session on how to create the next Gemstone Records hit. Learn everything about songwriting, creativity and how they work! More info on our Facebook Event Page. For those looking for an in-depth, interactive workshop, gaining hands-on experience and a thorough understanding of the art of production, mixing and mastering, put the 21st of October in your agenda! The Music Alliance Academy is giving a special workshop just for you. Visit their special event page to find out more information and register for Luca Pretolesi & Maarten Vorwerk’s masterclass on October 21st, hosted by Sonic City Studios in Amsterdam. Learn from the pro’s and take your production skills to the next level! For a limited time, Studio DMI is offering a €100 scholarship to the workshop using promotion code “HOWIDIDITADE” – make sure you don’t miss out, only 10 codes available! Sign up here for the Sunday workshop!